He lives! Just one look in the eyes of Rod, one recognizes the amazing artistic talent of Alan AJ Johnson. Papa Bear Paul has a new favorite in the Bear Fever collection: it’s Rod! He was first introduced to the art in 1957, when his father took him to a car show at the New York Coliseum and he saw Ed “Big Daddy” Roth pinstriping. He then picked up “one of the little brushes” and started painting. After high school, he used his painting talents to pay his way through the Newark School of Fine and Industrial Art. Following graduation, he worked as an advertising director for a Manhattan agency for five years and hated it. Within several years, he was traveling across the country to paint cars by request. His work appears in many car shows, including the prestigious Pebble Beach Concours d'Elegance in California. Loren Hulber, an avid car collector for most of his life, met Johnson several years ago at the Wheels of Time car show in Macungie. 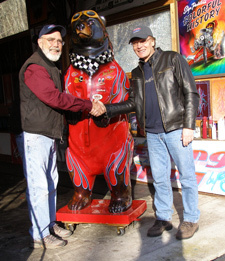 When the Hulbers decided to have a bear created to reflect Loren’s car passion, they immediately thought of Johnson. 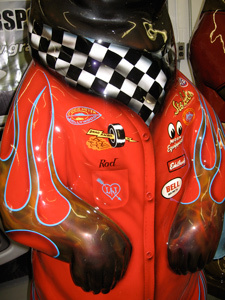 “Rod” is the Hulbers’ third bear. 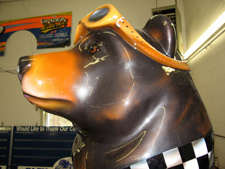 Their first bear, “Hul-Bear,” has a Pennsylvania German barn star theme and was by artist Eric Claypoole for their 25th wedding anniversary. 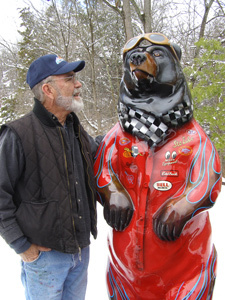 Their second bear, “Flora,” painted by Joseph Hoover, reflects a floral theme and Jody’s passion for gardening. The Hulbers display the bears at their historic (circa 1740) Fieldstone Farm. Besides their shared passion for art and automobiles, the Hulbers and Johnsons believe in helping others. Most of the car shows they attend benefit worthy charities. Similarly, they are planning to help the Boyertown community at the Hibernation event. While the plans are not finalized as of the publication deadline of this article, Johnson plans to demonstrate his pinstriping talent by painting selected vehicle(s) and will donate the fees to the Boyertown Salvation Army. For more information about Alan Johnson, visit www.alanjohnson grafix.com. Jody and Loren Hulber, long-time patrons of the arts, believe that richness in life comes from cultivating and sharing personal expression and creativity. The décor of their home reflects their appreciation for the arts with their collection of art by local artists. Their admiration for the Boyertown bears of the Bear Fever Community started the first time they drove through the quaint, historic community. ?They were familiar with the fiberglass animal forms, since they formerly lived in Chicago—the home of Cowpainters LLC, the company that creates the molds for such projects. However, it was the enthusiasm and collaboration of artists, sponsors and members of the community of all generations, as well as the leadership of the Stahls, that impressed them the most. The Hulbers are actively involved in many civic organizations, including the United Way, Lehigh Valley Hospital and the Macungie Farmers’ Market, to name a few. 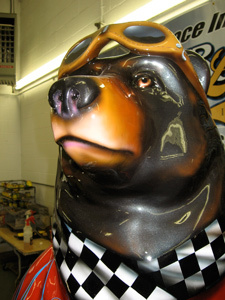 They often host community events at their home, where guests can view Hul-Bear. Fieldstone Farm, circa 1740, was originally part of a land grant of the William Penn Walking Treaty, said Jody, who extensively researched the history of the property for her master’s thesis. The Hulbers consider themselves stewards of this 120-acre property, the largest remaining single tract in southern Lehigh County. They are committed to sustainable agricultural practices and conservation and participate in the Forest Stewardship Program. Jody, a member of the Pennsylvania Association for Sustainable Agriculture, grows organic apples and produce and is an active supporter of the Macungie Farmers’ Market. She is a beekeeper and raises fancy breed chickens. Loren has a lengthy list of career achievements as an entrepreneur and builder of high performance businesses. He is currently a high performance business consultant to technology organizations. He served as the chairperson for CorrectNet, Inc. and USAData, Inc. He was the former chair and CEO of Incurrent Solutions, Inc., and he supervised the development of several other corporations. This energetic, high-achieving couple admires the comparable industriousness of the early Pennsylvania Dutch who settled the land and made the area prosper. They appreciate the practical application of the farm’s construction and the tools and implements. Prior to Incurrent, Loren was founding CEO, President and Chairman of NCES, an outsourced provider of human resource services to thousands of companies and tens of thousands of employees in 46 states. Loren took the company from start-up to $1.3 billion in revenues, completing numerous acquisitions and an IPO, and ultimately selling the company to Fidelity and AFLAC. As President & CEO of Day-Timers, Inc., Loren led this direct marketer of time management tools into reseller channels like Office Depot and Staples, generated record results and produced the strongest revenue and profit growth in the history of this 50 year old company with 4.5 million users. He led Day-Timers into software, acquiring and successfully integrating a leading developer of time management solutions for PC’s and hand-helds. Jody has a Masters Degree in Liberal Studies from Lake Forest College in Chicago. She is a beekeeper, raises fancy breed chickens, and grows organic apples and produce in addition to being an active community volunteer and board member. We are both committed to sustainable agricultural practices that do not harm people, animals or the land. Jody is a member of PASA and we participate in the Forest Stewardship Program. Our farm, Fieldstone Farm, is the largest remaining tract of land in southernmost Lehigh County, and we look upon ourselves as stewards of this property that dates back to a land grant from the William Penn Walking Treaty to the first of nine owners, who were Swiss. We admire and seek to preserve the practical culture of the early 'Pennsylvania Dutch' who settled and made this land and area prosper.